Planning a Trolls Birthday Party? 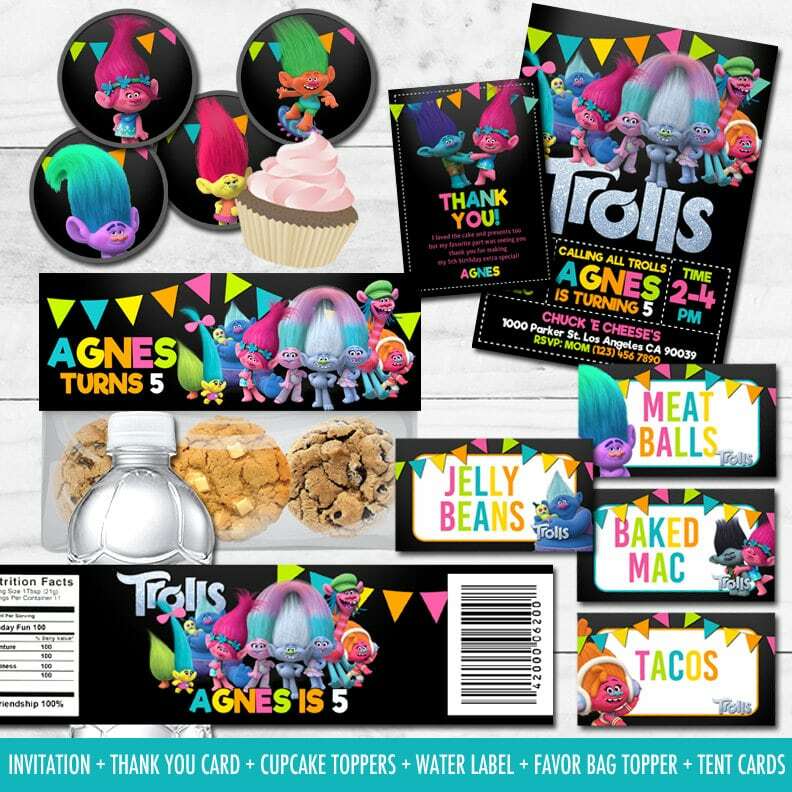 We’ve got you covered with the best Trolls Party Ideas – Trolls party supplies, party favors, invitations, decorations, games, and more! We make your party planning easy peasy! 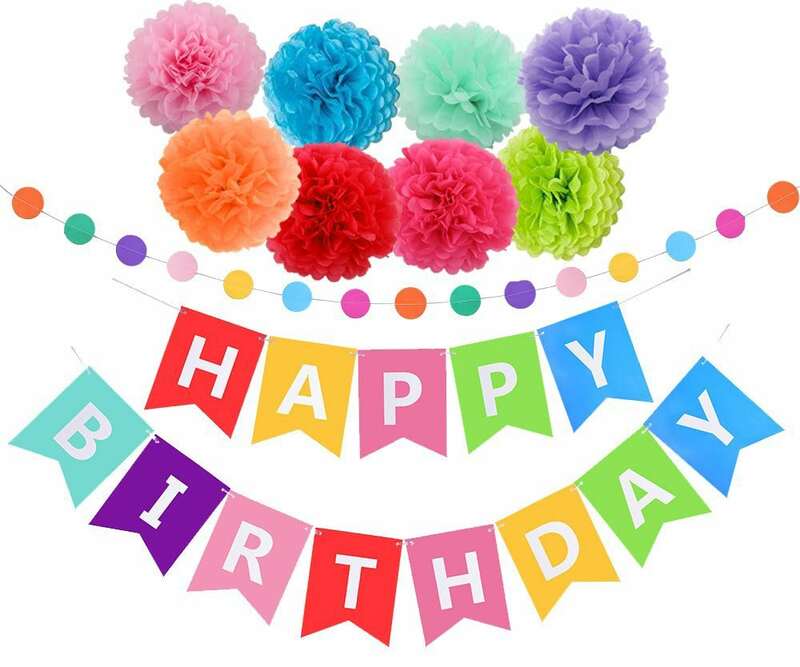 Are you planning a Trolls birthday party? 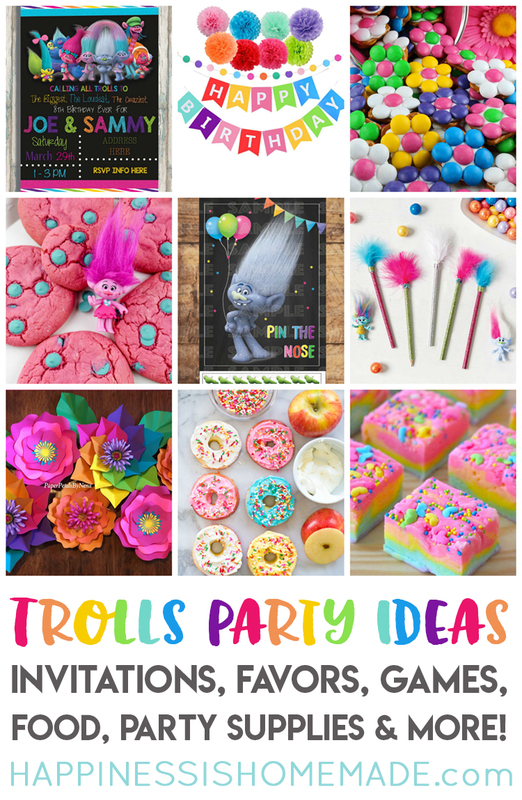 We’ve rounded up the very best Trolls party ideas to make your party planning simple! 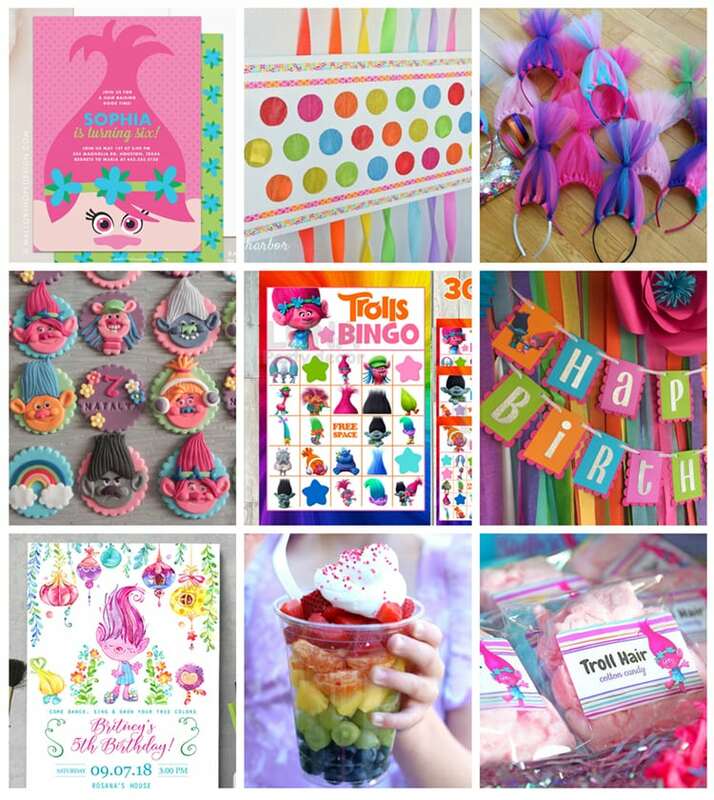 We’ve got everything from Trolls party supplies and favors to games and party food – just scroll through and choose your favorites for an easy-to-plan party! 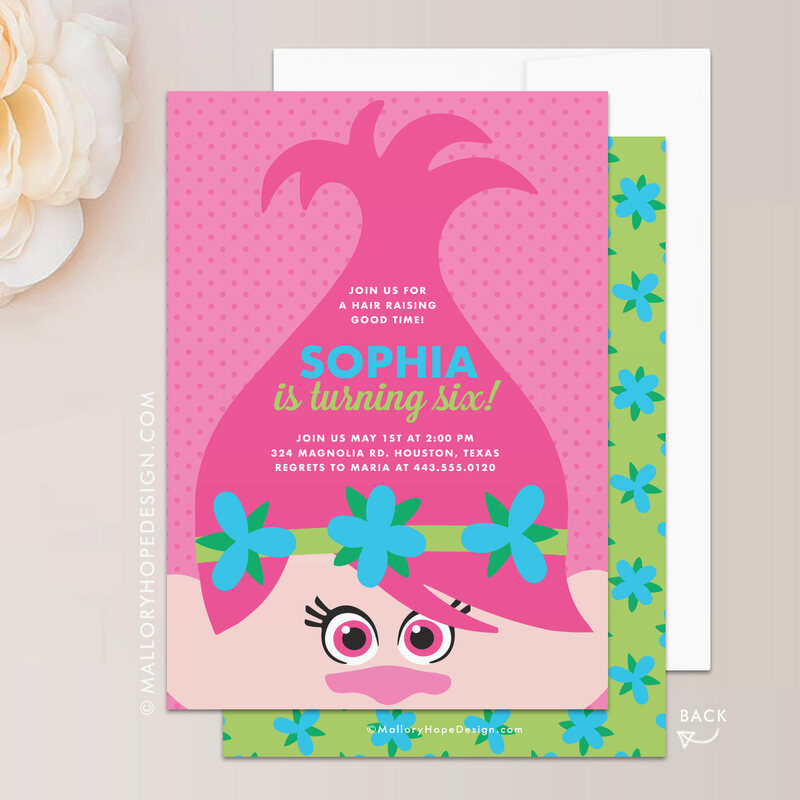 These colorful Trolls Birthday Party Invitations from Bug & Bean Graphics are absolutely adorable and feature all of your favorite Trolls characters! These peek-a-boo Poppy invitations from Mallory Hope Design are so cute! If your party colors are more blue than pink, these Branch invitations from iDesign Printable might be perfect for you! 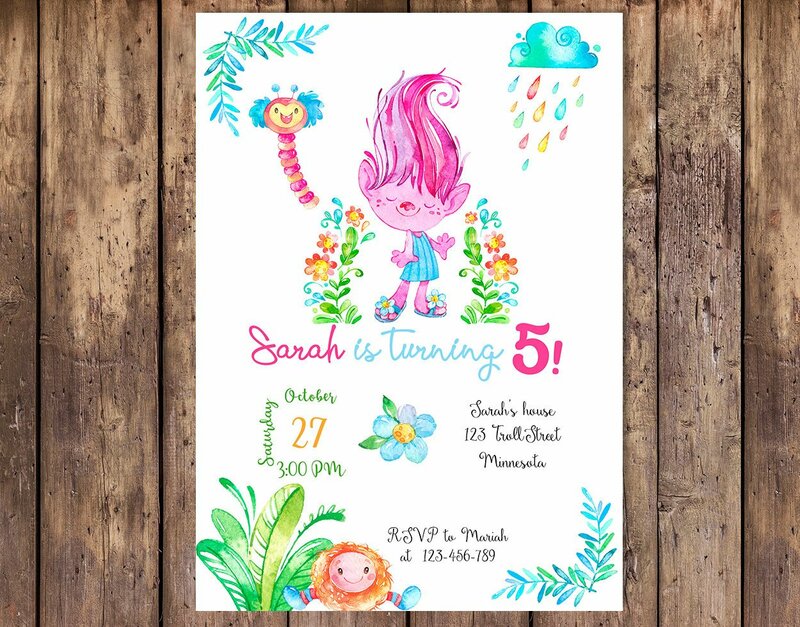 These watercolor Trolls party invitations from Paulaparalua are so pretty! It comes in a cute blue version, too! 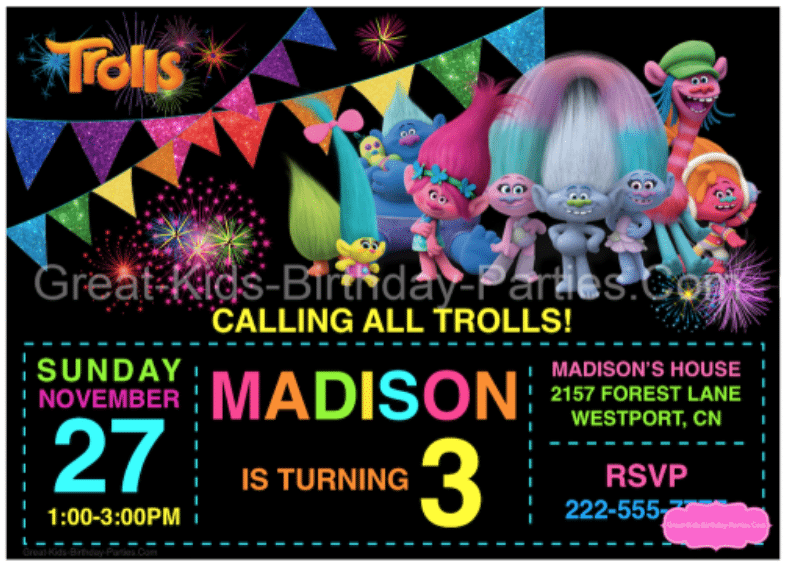 Great Kids Birthday Parties has these fun and FREE editable Trolls party invitations available for download along with LOTS of other Trolls birthday party decorations! 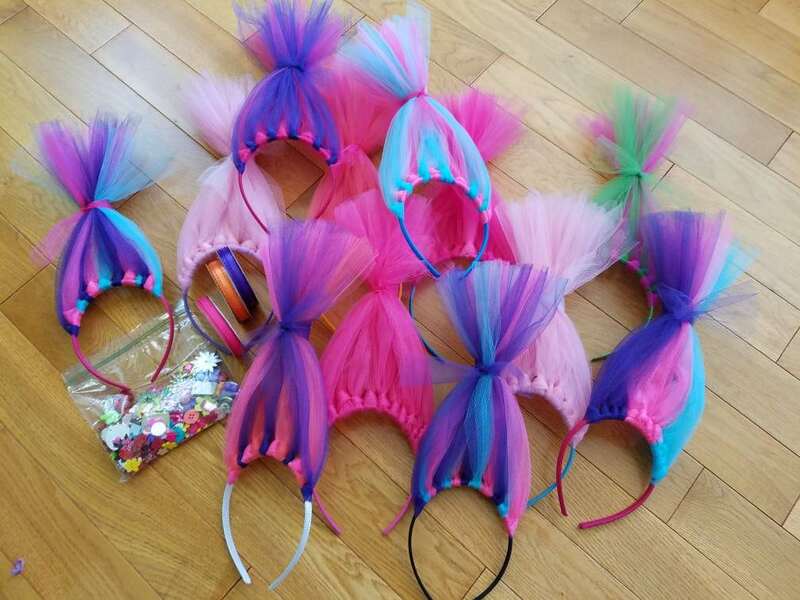 Trolls party supplies and Trolls party decorations are not difficult to find, but there are SO many options to choose from that it can be overwhelming! We’ve narrowed it down to our top favorites to make things a little easier for you – many of these ideas you can DIY on your own, but I’ve also included links where you can purchase the decorations pre-made. Whatever works with your time and budget! 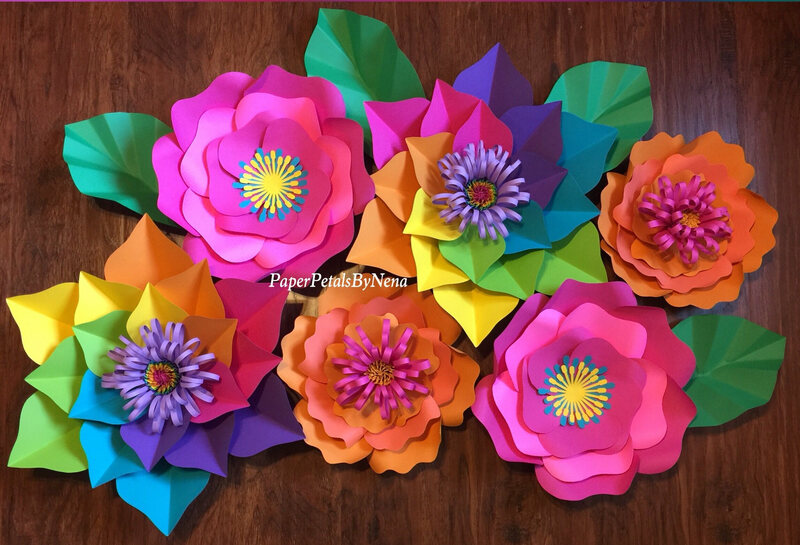 These gorgeous paper flowers from Paper Petals by Nena come in all shapes and colors and would make perfect party decorations! If you’d rather DIY your own paper flowers, check out this tutorial from my friend Jennifer at The Craft Patch. 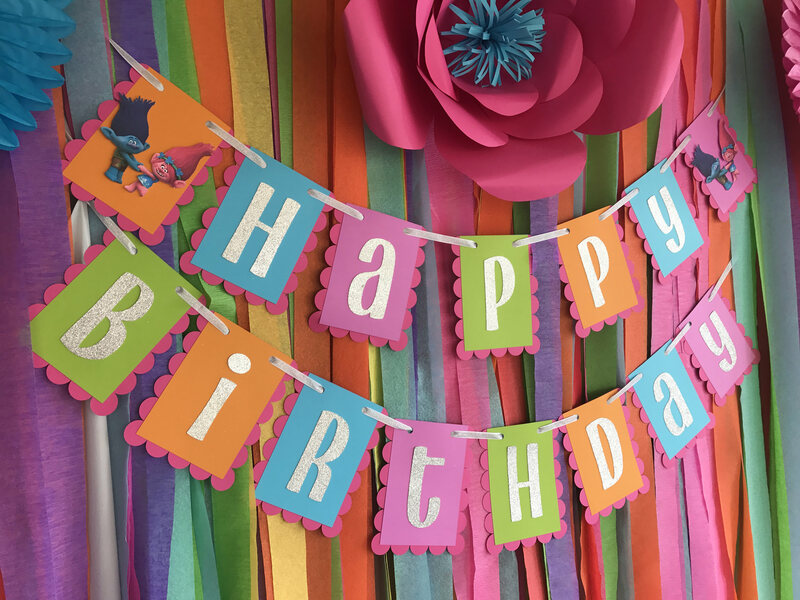 Simple rainbow-colored decorations are perfect for a Trolls birthday party, and they can be re-used again and again for other party themes! 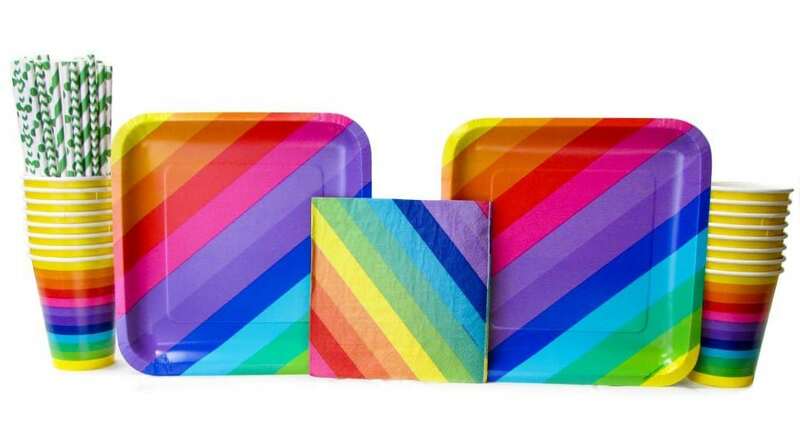 Rainbow Party Supplies are also a great choice! 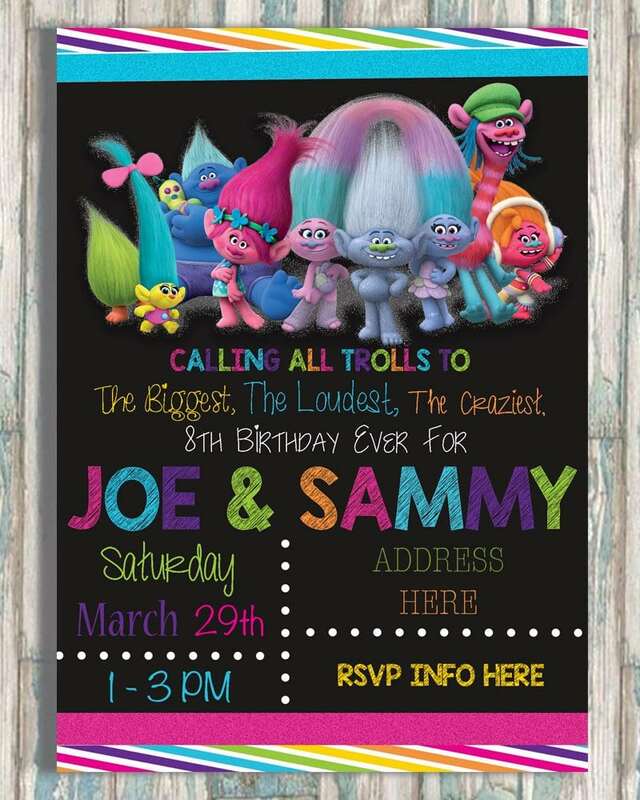 You can coordinate your entire party theme with this easy-to-use Trolls Printable Party Kit from Oh Party Invitation! 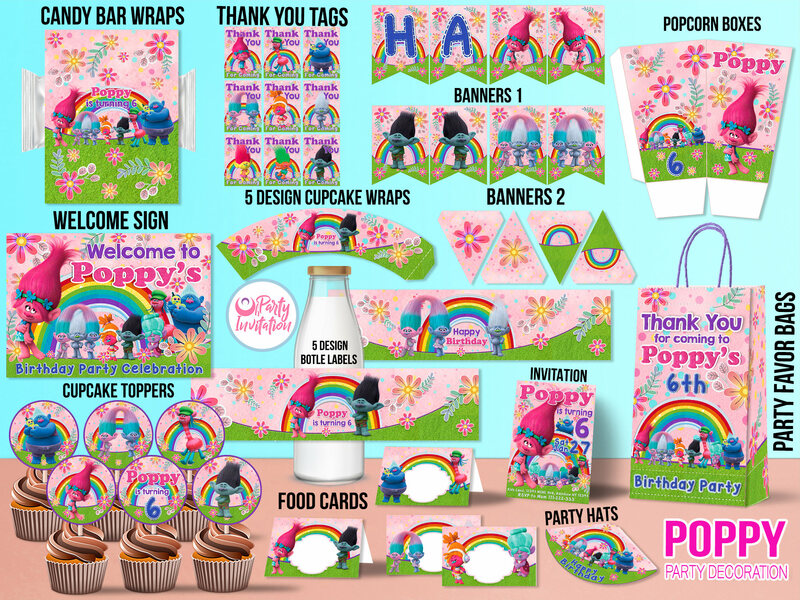 This kit has everything you need to decorate your party from invitations to decorations to treat bags and more! 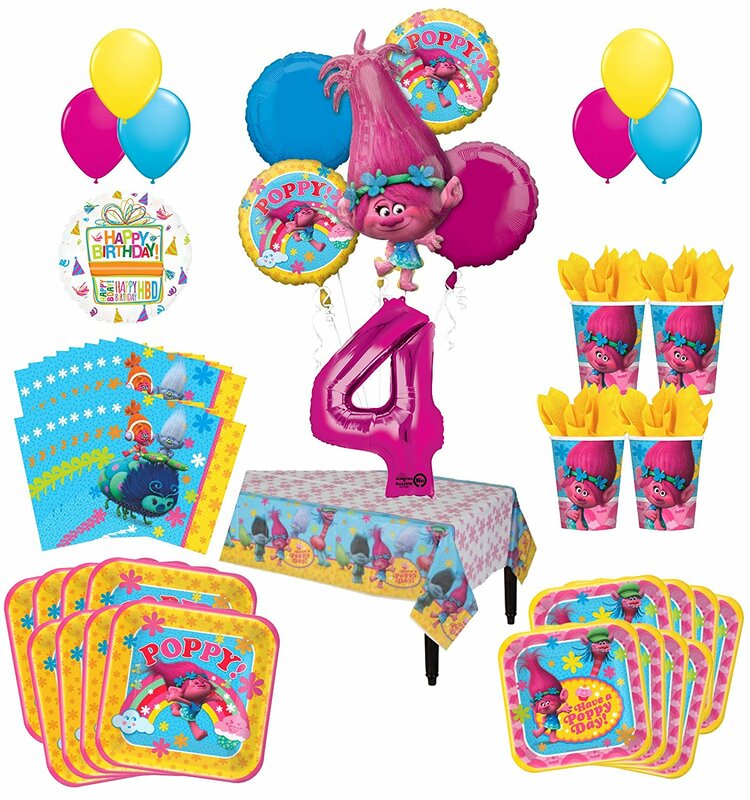 This Trolls Party Supplies Pack is ready to go with plates, napkins, cups, balloons, and more! 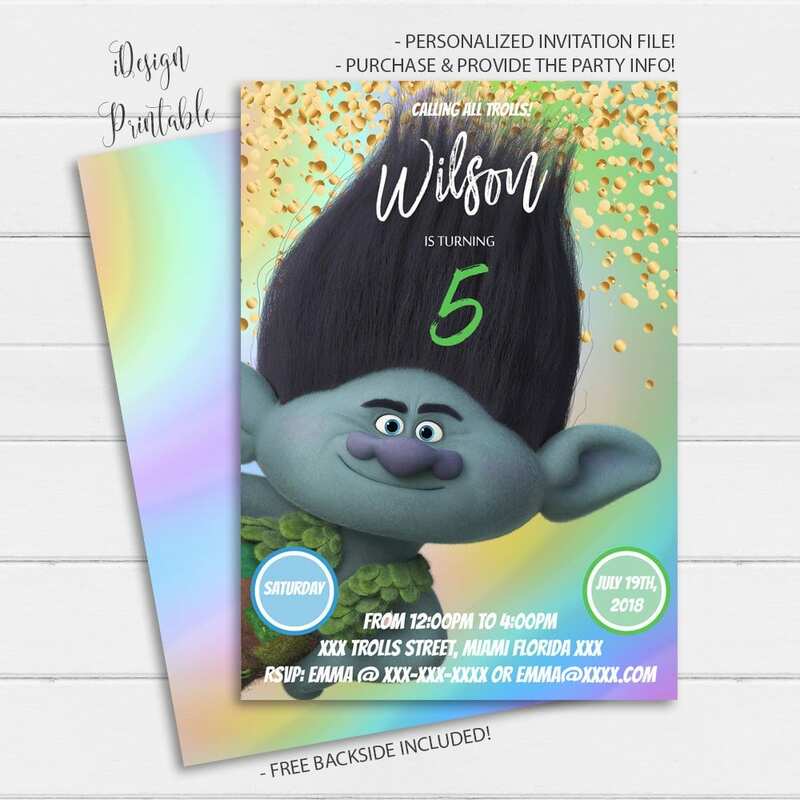 This printable party pack from Party Hooray is perfect for a girl or a boy and features all of the most popular Trolls characters! 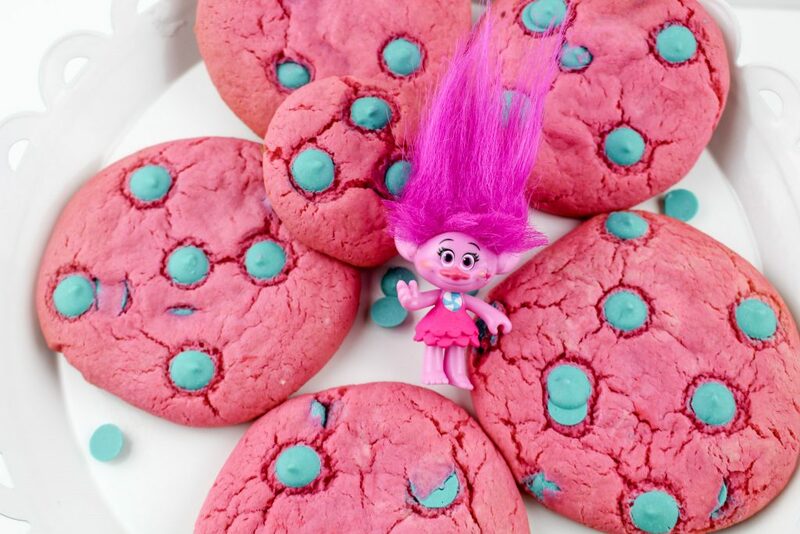 A party isn’t a party without yummy food, and these are some of the cutest Trolls party food and dessert ideas we’ve seen! Fondant cupcake toppers are the easiest way to take basic cupcakes from boring to awesome! 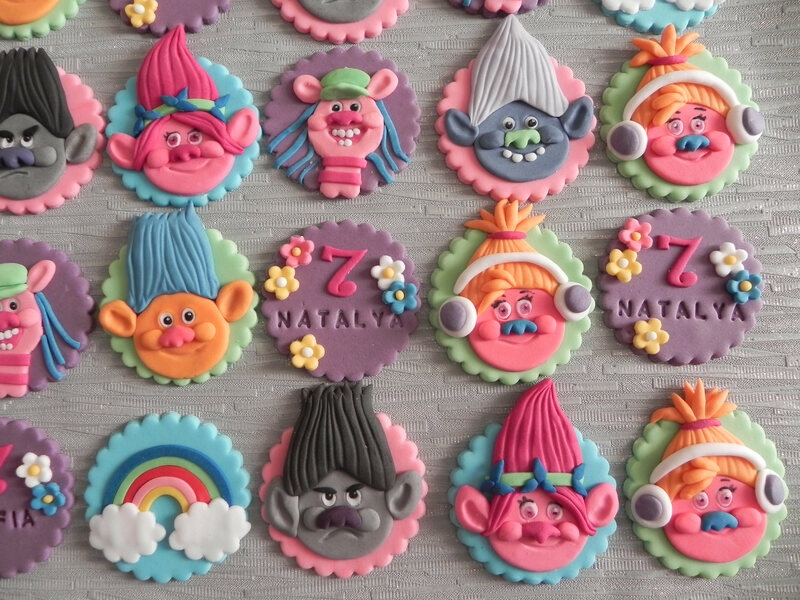 These Trolls Cupcake Toppers from Cake Toppers by Maris are seriously incredible! Pink Poppy Cookies by Sippy Cup Mom are easy to make and sure to wow your party guests! 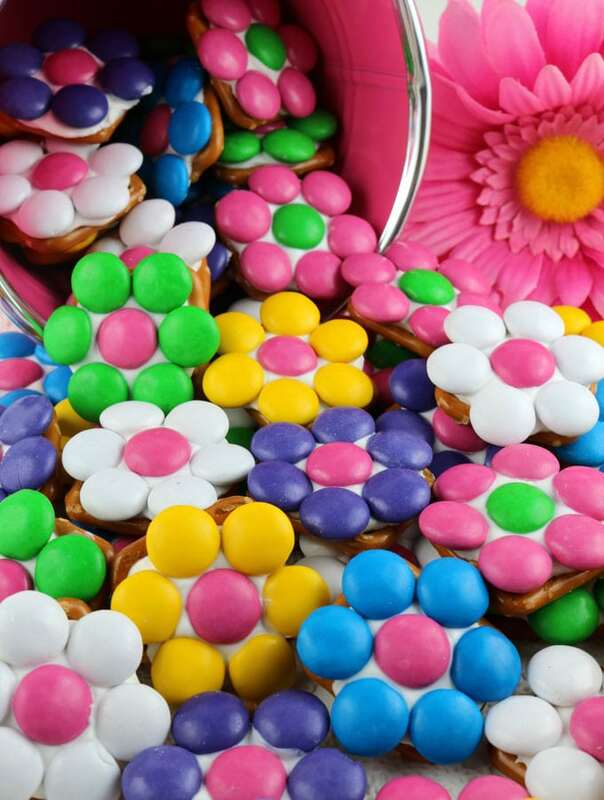 These Flower Pretzel Bites from Two Sisters Crafting are almost too cute to eat…but they taste delicious! 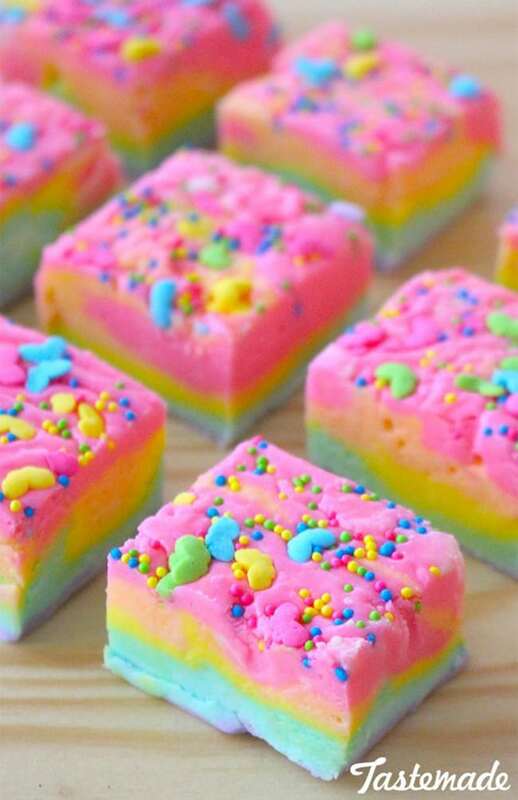 Rainbow fudge…need I say more?! I love this bright and cheery version from Tastemade. 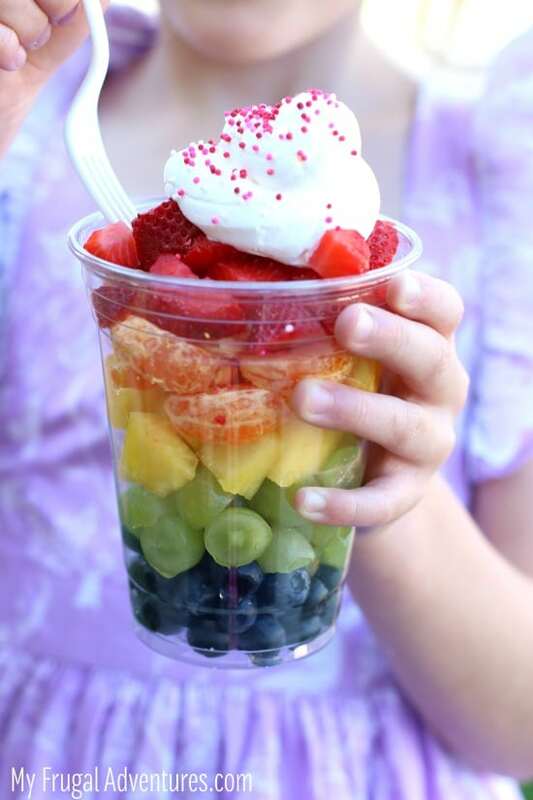 Of course, HEALTHY rainbow foods would be great for a Trolls birthday party as well, and these Rainbow Fruit Cups from My Frugal Adventures are perfect! 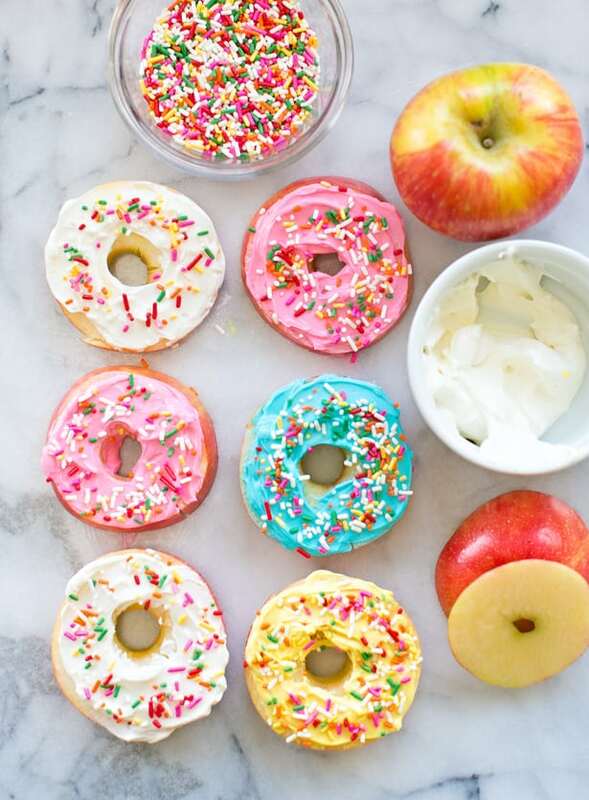 These Apple Fruit Donuts from Hello, Wonderful are another adorable (and healthier!) alternative to all of those sweet treats! Of course, your guests will want something fun to make or do at your party, so we’ve selected our top five favorite Trolls Party Games and Activities for you! 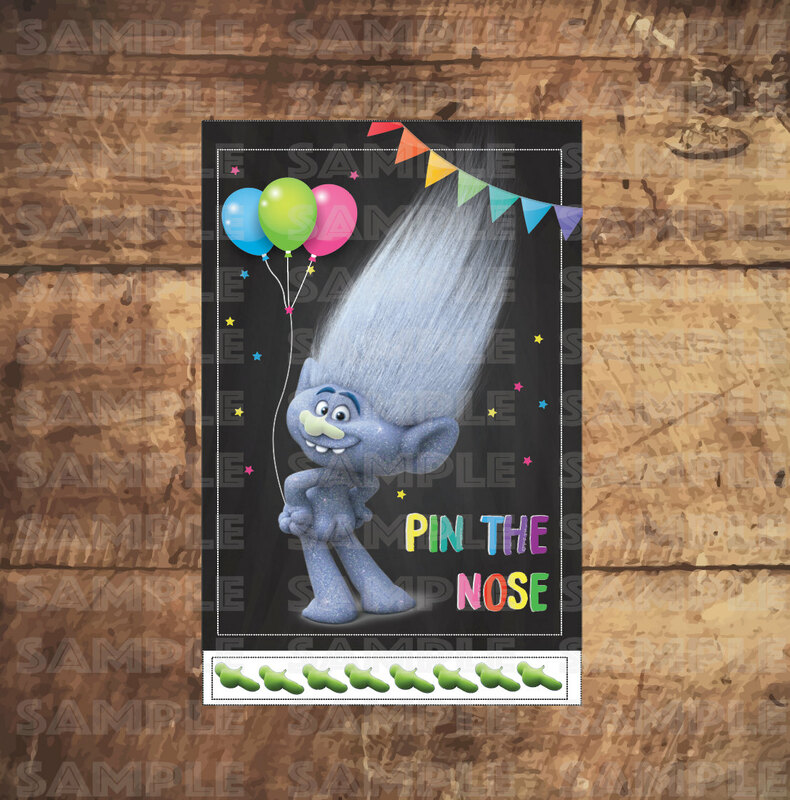 Play Pin the Nose on the Troll with this fun printable Trolls party game by Trustiti! If the bare booty isn’t your style, there’s also a Poppy version and a Branch version as well! 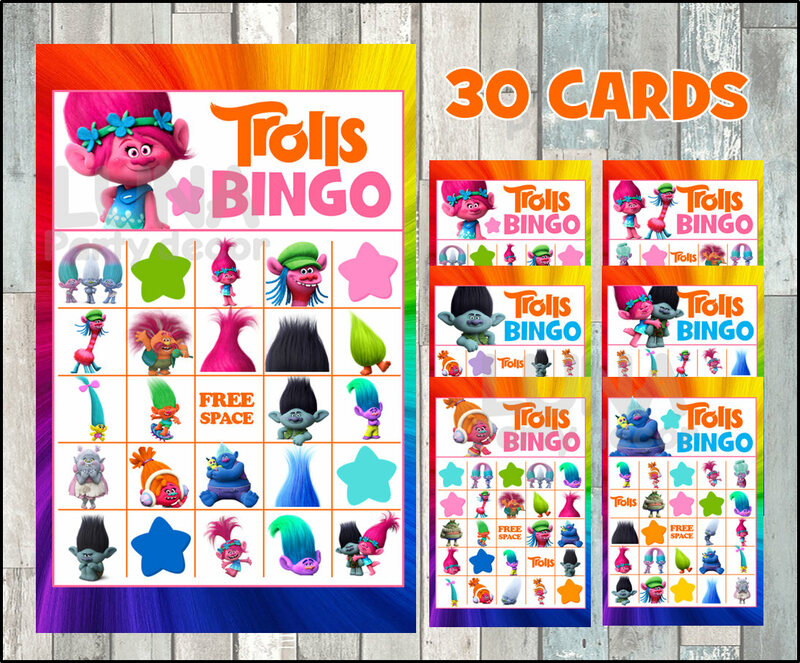 This Trolls Bingo Game by Luna Party Decor has THIRTY different cards, so there’s more than enough for your whole party crowd to play along! 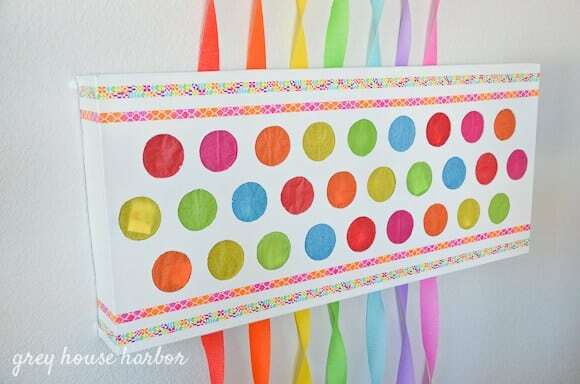 This Rainbow Punch Pinata from Grey House Harbor would be perfect for kids of all ages – fill it up with some of the goodies from the next section – Trolls party favors! Make Trolls Bracelets with this fun DIY kit! 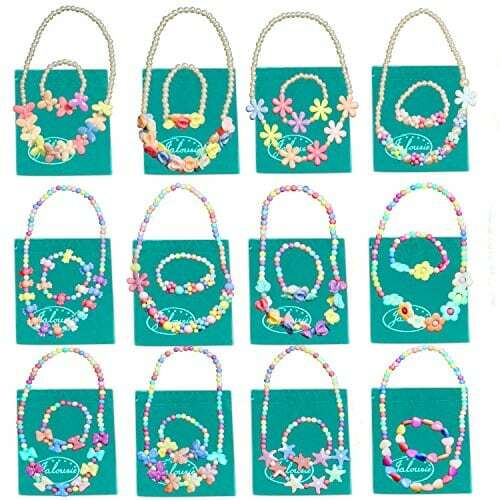 Each kit contains enough supplies to make eight bracelets. Make DIY Trolls Headbands with the tutorial from DIY Inspired, or you can purchase these headbands pre-made from M and Emm Designs and just have the kids add the final flowers and embellishments. 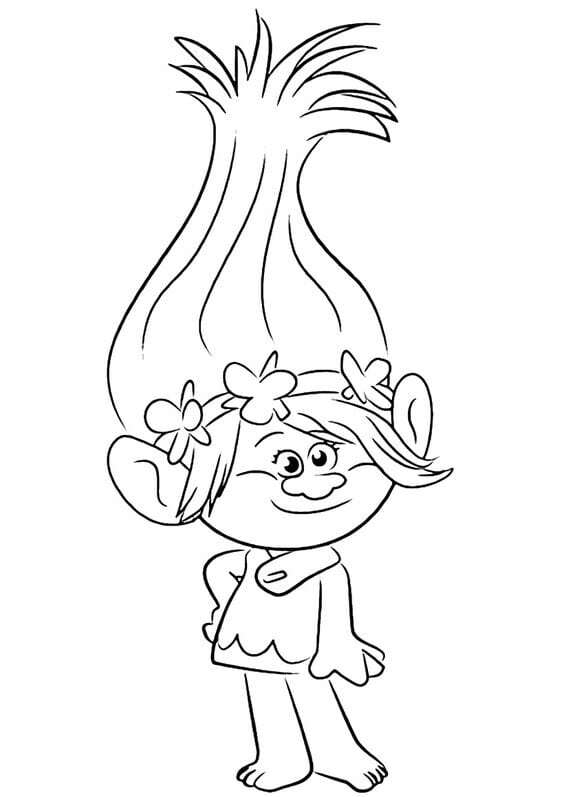 Find lots of FREE Trolls Coloring Pages here for a fun and inexpensive party activity! 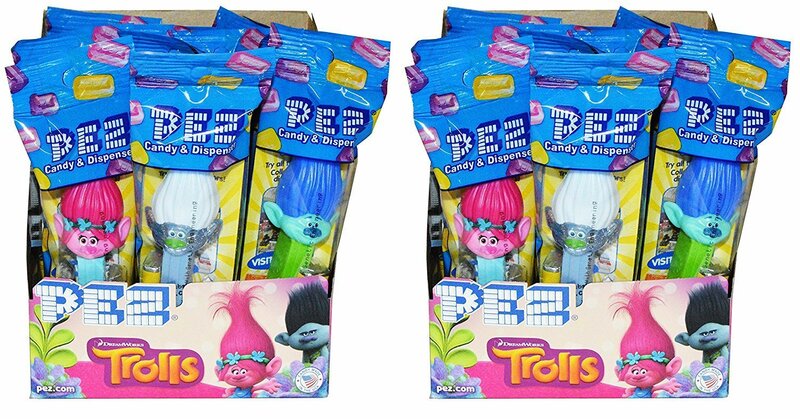 There are SO many awesome Trolls Party Favors that it’s hard to narrow down the choices, but these are our top favorites that are sure to be a huge hit! 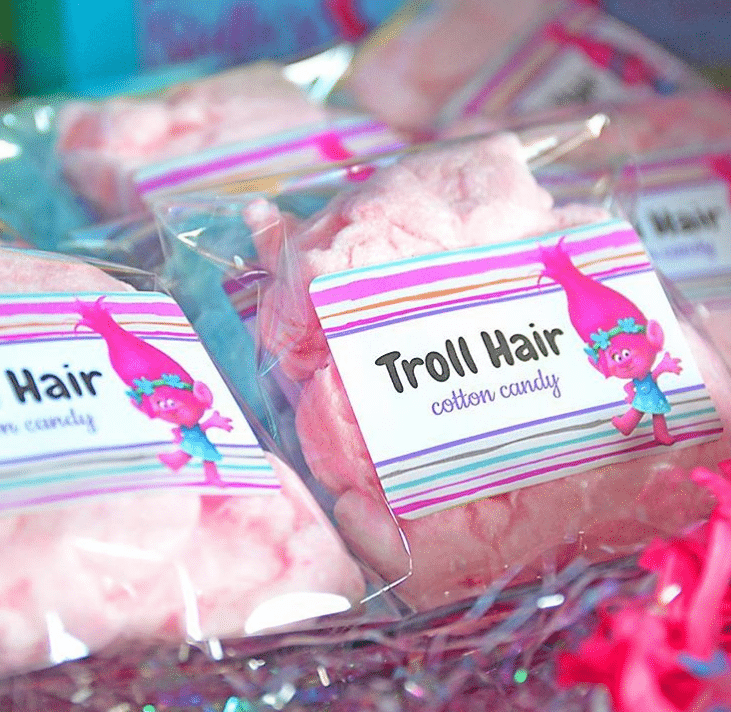 Send your guests home with a goodie bag of Troll Hair Cotton Candy – one of the cutest and easiest party ideas ever! Get similar printable labels from Trustiti. 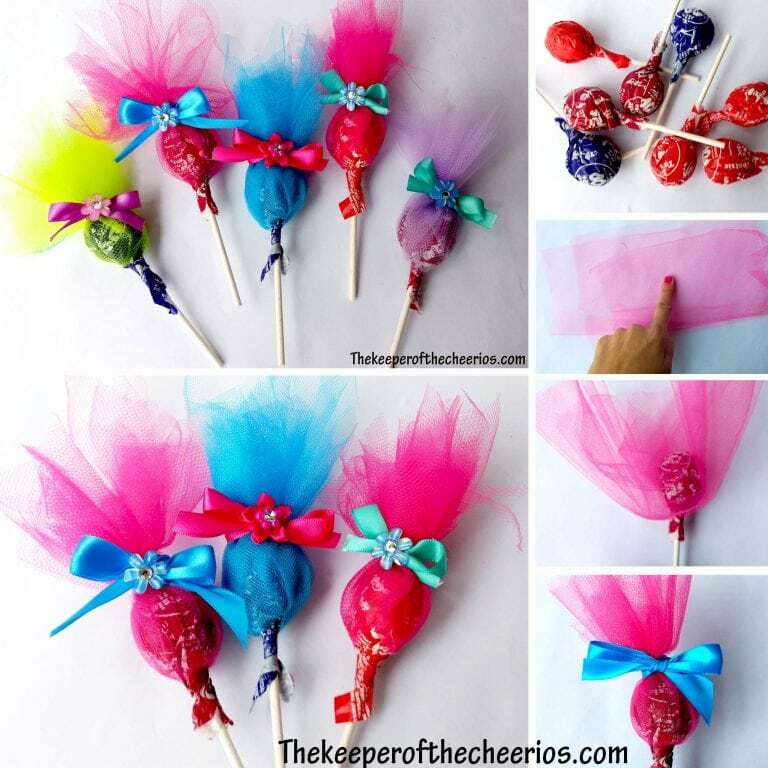 Make these adorable Troll Lollipops with the tutorial from The Keeper of the Cheerios – or you can purchase pre-made Troll Lollipops from Craftastic Paula. 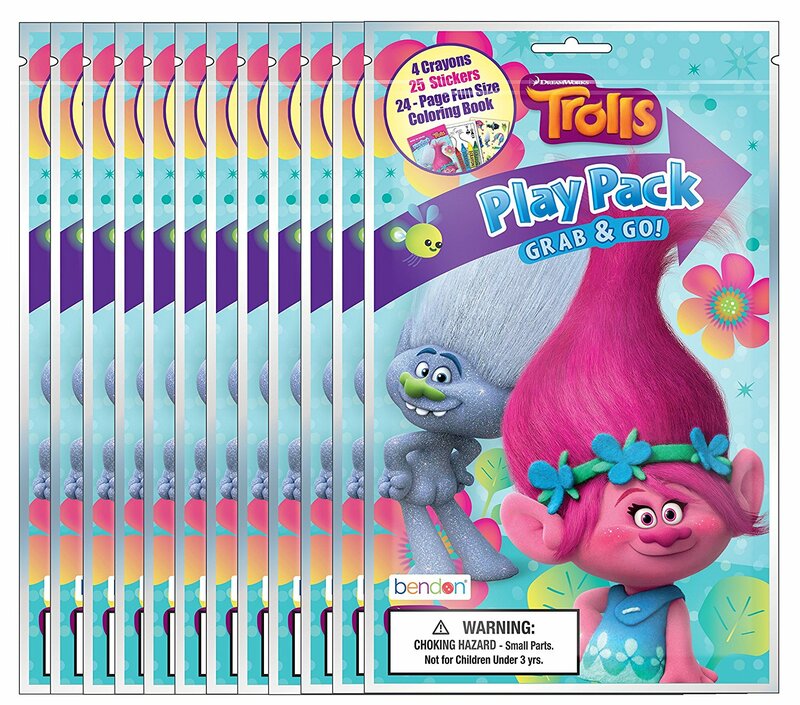 These Grab ‘n’ Go Trolls Play Packs are the perfect all-in-one favor pack – each bag contains 4 crayons, 25 stickers, and a 24-page mini coloring book. 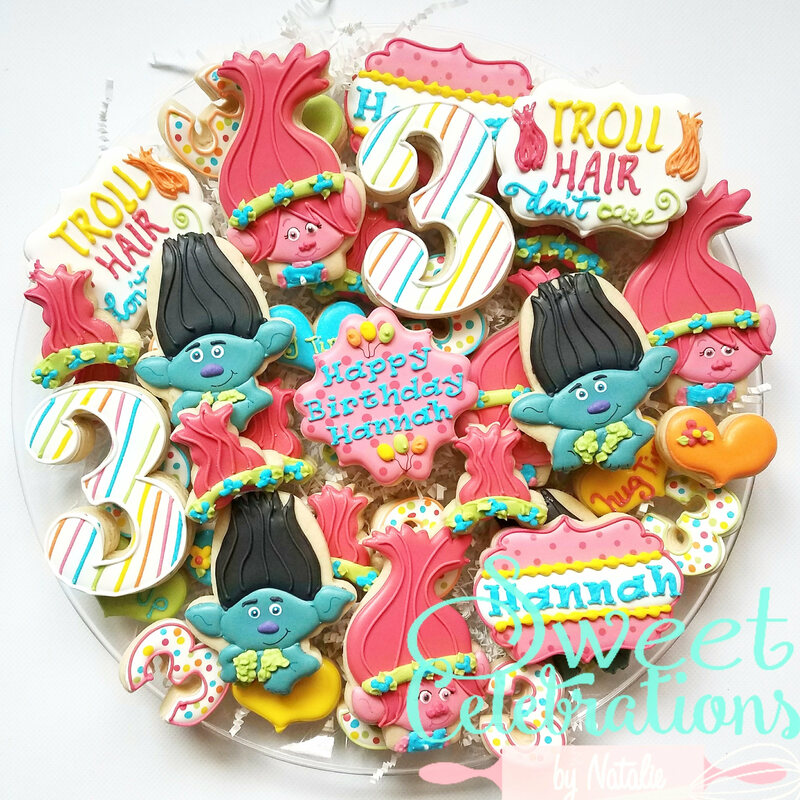 I’m blown away by the level of detail in these Troll Cookies by Sweet by Natalie – it is incredible! 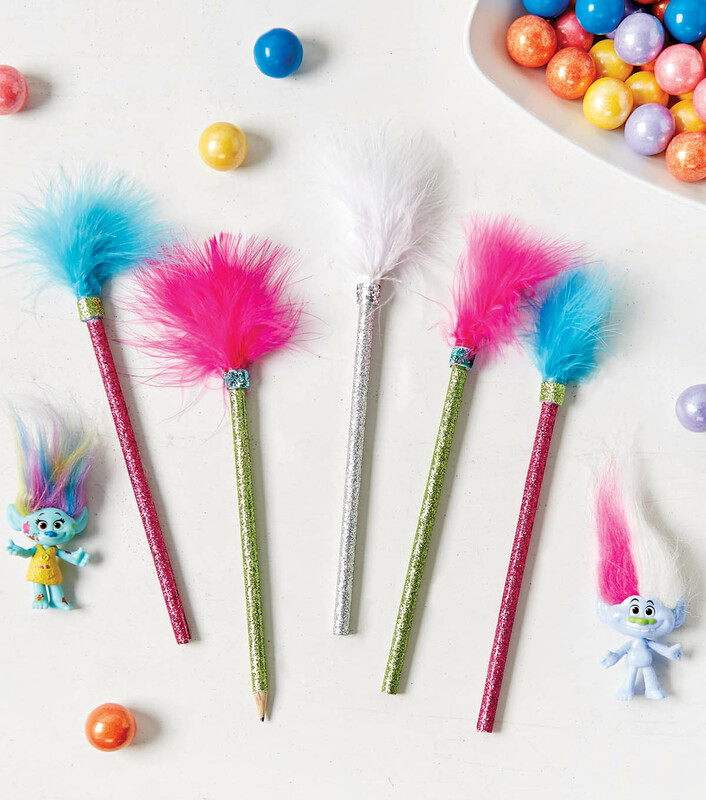 Make Troll Pencils with this tutorial from Joann.com or purchase Troll Pencils from Amazon.com. My kids and all of their friends LOVE Pez dispensers, so I know that these Trolls Pez Dispensers would be a huge hit at our party! 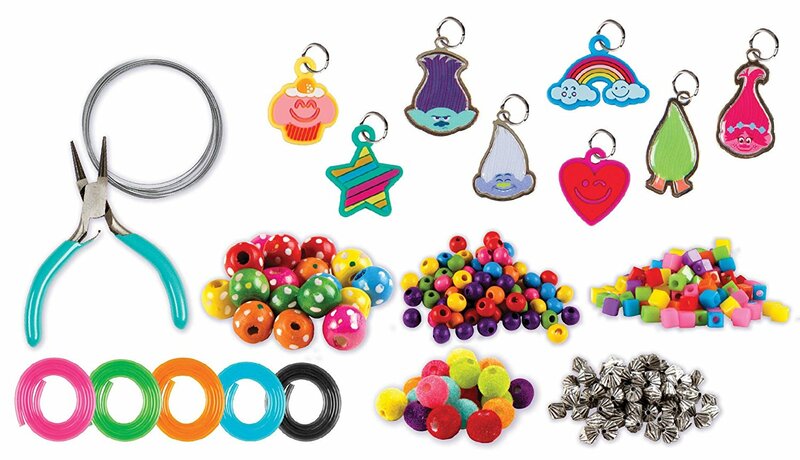 These fun Colorful Kids Jewelry Sets are a sweet and inexpensive party favor idea (that cost just over $1 per person!)! And, of course, rainbow and flower-themed goodies are excellent choices as well! Planning your Trolls birthday party is easy peasy with this ready-to-use Trolls party plan idea! Just choose your favorite ides from each category, and your party planning is done! Happy Trolls partying! IN these Trolls Party Ideas for Later! The ultimate ideas for having fun in the birthday party. Especially the minute to win games are awesome.